No trip to northern Portugal is complete without a visit to Braga. Founded two thousand years ago by the Roman emperor Augustus, the third-largest city in the country has a long cultural and religious history, which is reflected in its grand architecture and pious reputation. 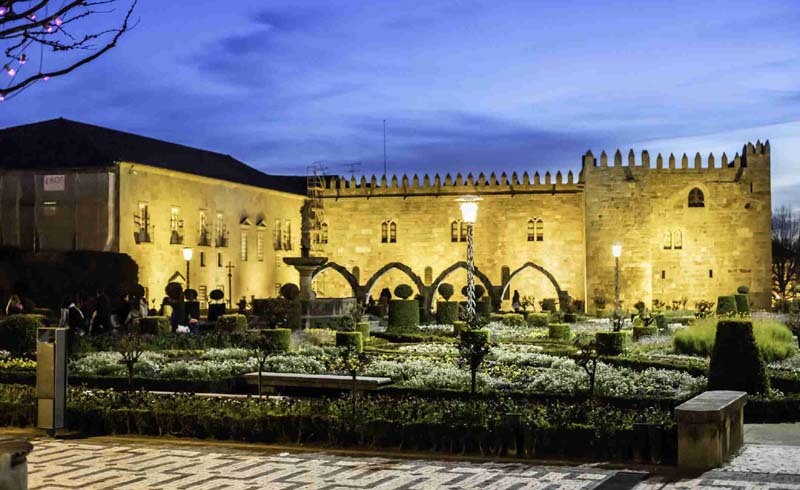 While it’s possible to see most of Braga’s main attractions in a day trip from nearby Porto, it’s equally possible to spend a night or two exploring the city and surrounding areas. Here are the top things to do while you’re in town. 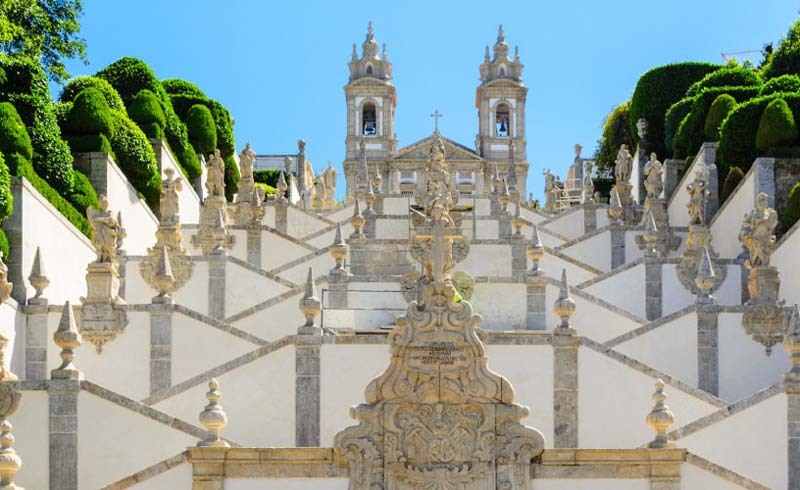 Braga’s cathedral dominates the downtown area, and you’ll find yourself walking past its various facades several times as you explore the compact old city. Parts date back as far as the 11th century, and it's likely the oldest surviving church in the country. It definitely doesn’t look the same as it did back then, however. The cathedral has been restored and added to several times over the years, and Baroque, Gothic, Romanesque, and several other architectural styles are clearly evident. Don’t just take photos of the outside, though. Pick up a ticket at the entrance, where for four euros you’ll gain access to the impressive interior, along with the cathedral’s small museum full of religious art. Once inside, be sure to gaze up at the pair of impressive gilt wood organs. Heavily decorated, they were carved in the 1730’s, and dominate that section of the cathedral. Also be sure to check out the cloisters while you’re there, along with the three adjacent chapels. 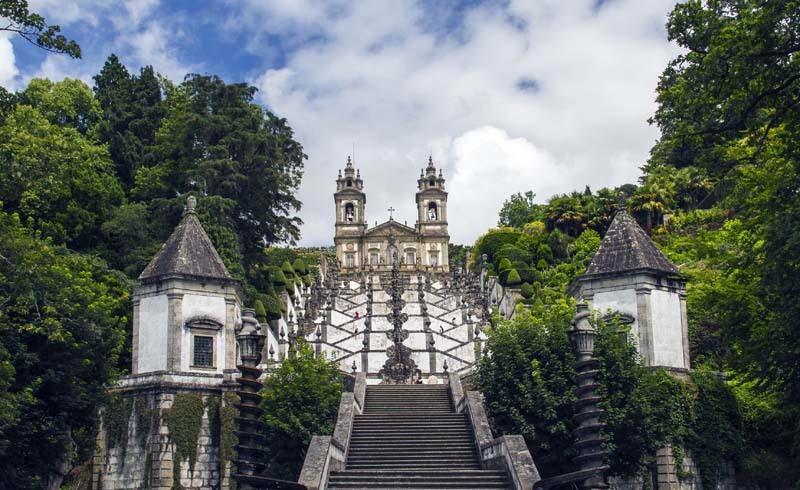 On the outskirts of the city lies Braga’s biggest attraction, the Bom Jesus do Monte basilica—and the 630 zig-zagging steps it takes to reach it. Unless the day is particularly hot, don’t be overly concerned about the climb, as it’s not as difficult as it looks. If it does seem too daunting, there’s a water-powered funicular—the oldest of its type in the world—that can take you to and from the top for a few euros instead. Intricate fountains line the steps, based around the five senses. Water pours from an orifice of each the human-shaped carvings, and they’re an attraction in their own right. While the neoclassical church at the summit is the goal of the climb, the expansive views over the city and surrounding area are equally impressive. A nearby terrace cafe serves welcome cold drinks and snacks, and there are paths and gardens to explore if you haven’t had your fill of walking yet. Bom Jesus do Monte is easy to get to by car or taxi, or just catch the number 2 bus from any one of a number of downtown stops. The bus takes about 20 minutes, and runs every half hour Monday through Saturday, less often on Sundays. Northern Portugal is renowned for the production of vinho verde. Literally translated as “green wine,” this refreshing, slightly-effervescent wine is the perfect summer beverage. 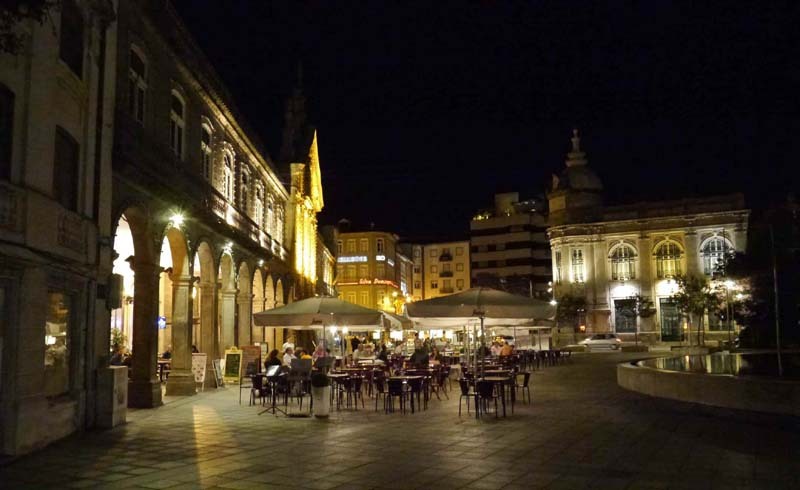 Head to Praça da República, find an outside table at one of the many restaurants, and enjoy a leisurely glass or bottle with friends. Vinho verde comes in red, rose, and most commonly, white varieties—the “green” in this case means “young,” as it’s traditionally consumed soon after bottling. When you’re done, take a few minutes to explore the rest of the large plaza. 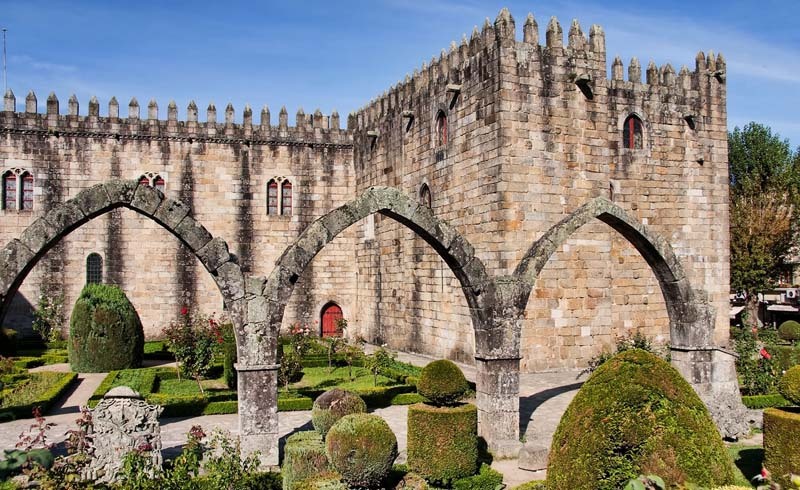 With grand architecture surrounding a central fountain, including the Congregados church and what’s left of the keep of Braga’s castle, and plenty of opportunity to people-watch day and night, it’s very much a place to linger. Lying along the eastern edge of the impressive former archbishop’s palace, the manicured Jardim de Santa Bárbara is a haven for visiting birds and humans alike. Arranged around a statue of the saint of the same name, the design is a modern reinterpretation of gardens that have sat on this spot since the 1600’s. The colorful flower beds are at their best in spring, but the garden is worth a visit at any time of year. It’s relatively small—10 or 15 minutes is enough to see everything—but is a great spot to linger with a pastry or ice-cream on a sunny day. Be sure to check out the remains of the medieval arches while you’re there! 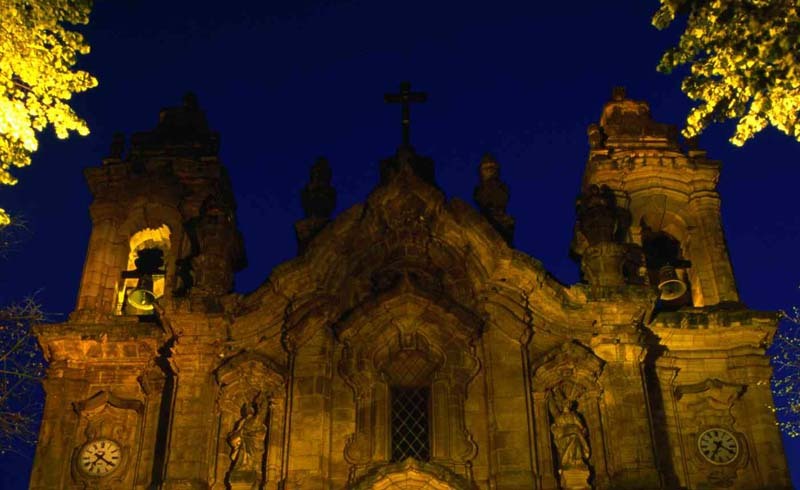 Given its long religious history, it’s no surprise that Braga is full of churches. You could spend days exploring them all, but should include at least one or two on your itinerary even if you’re only in town a few hours. 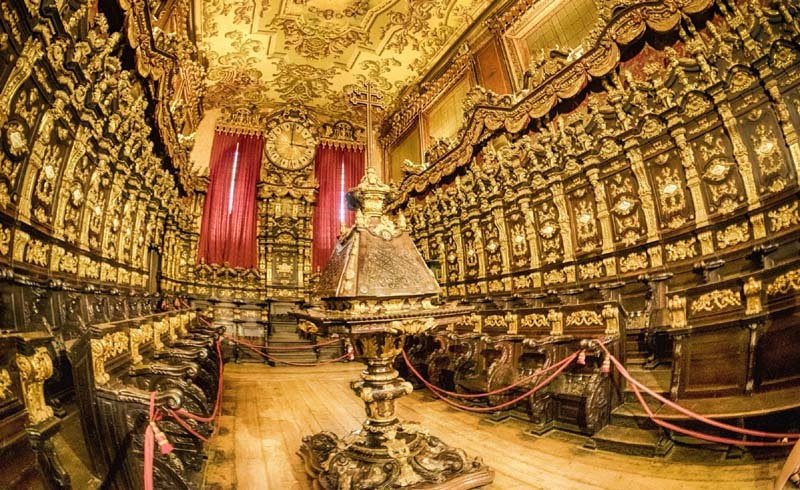 Alongside the cathedral sits Braga’s Misericórdia church, and if ornately-decorated churches are your thing, you definitely need to pay it a visit. Construction started in the mid-1500’s, but it’s the Baroque interior from a century later that remains to this day. The area behind the altar is remarkable, covered floor to ceiling with intricate golden arches, statues, murals, and much more. There’s no entry fee, although donations are always welcomed. The São Frutuoso chapel lies in the north of the city, not far from the football stadium. The 18th-century Baroque church is interesting enough in its own right, but it’s the small chapel inside that’s the real attraction. Shaped like a Greek cross, it dates back to the Visigoths more than a millennium earlier and has been classified as a Portuguese national monument. It’s open to the public, but you’ll need to time your visit carefully—the chapel is closed on Mondays, Tuesday mornings, weekends, and a few public holidays. Braga has a wealth of museums, on a wide-ranging set of subjects. 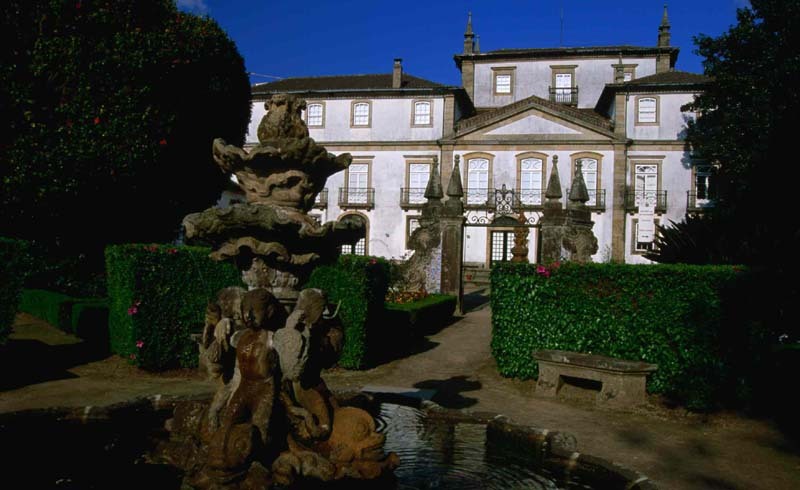 One of the most popular is the Biscaínhos Museum, the home of a local noble family for several generations. The residential palace was at its peak in the 17th and 18th centuries, and most of the decoration and artifacts inside date to that period. While the furniture, textiles, and ceramics (including a hall dedicated to Portugal’s famous blue azulejo tiles) are impressive, it's the large grounds that steal the show. The terraced lawns and flower beds are considered one of the best remaining examples of a Baroque-period garden, and are highly worth a visit even if you don’t have time to explore the museum itself. Entry to the grounds is free, and a ticket to the museum costs a very reasonable two euros. It’s closed on Mondays.